Keep them in a box or cupboard with a lock or store them well out the reach of children. Soluble Aspirin tablets: For adults and older children. Good for headaches, colds, sore throats and painful bruises. Sedative Cough Linctus: For dry or painful coughs – but not coughs caused by the common cold. Menthol Crystals: Add hot water to make steam inhalations for treating catarrh and painful dry or painful coughs. Vapour Rub: Again for steam inhalations. Also useful for children with stuffy noses or dry coughs. Rub on the chest and nose. Antiseptic Cream: For treating grazes, spots and sores. Calamine Lotion: For dabbing on insect bites, stings and sunburn. 3” Wide Crepe Bandage: To keep dressings in place and support sprained or bruised joints. Cotton Wool: For cleaning cuts and grazes. 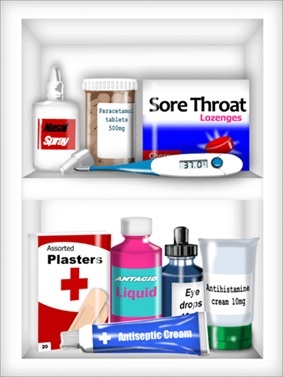 Please remember that your local chemist can give you advice about medicines.